The Montreal Canadiens are making moves Thursday. After pulling off their second blockbuster trade in two offseasons by trading defensive prospect Mikhail Sergachev for forward Jonathan Drouin, Canadiens’ general manager Marc Bergevin has signed forward Charles Hudon to a two-year, one-way contract with an annual cap hit of $650,000. The deal was announced by the Canadiens shortly after their trade to acquire Drouin was made official. Canadiens agree to terms on a two-year extension with Charles Hudon. DETAILS -> https://t.co/ipKQ0Nrf2P. Hudon was drafted in the fifth-round of the 2012 NHL Entry Draft by the Canadiens and has played in just six career games with the Canadiens in the NHL to date, though he’s compiled an impressive four assists in that time. With 75 goals and 162 points in 207 career games in the AHL, including 27 goals and 49 points in 56 games last season, Hudon has proven to be a very capable player. 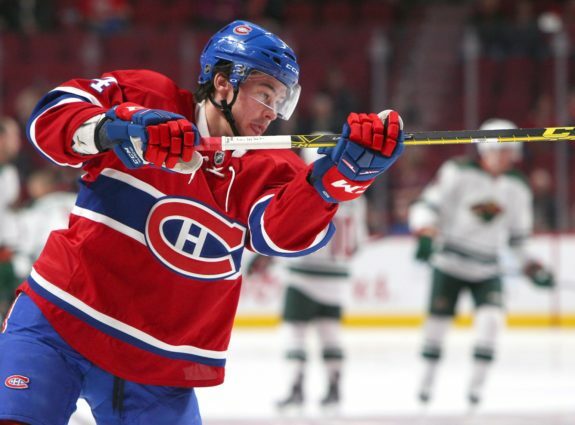 Though his NHL opportunities have been few and far between, many have called for Hudon to see consistent playing time in the NHL given his skill set and potential to fill a top-nine role for the Habs sooner than later. With a two-year, one-way deal, the Canadiens could finally be looking to use Hudon in the NHL rather than playing him at the AHL level. With the upcoming NHL Expansion Draft, however, this contract could end up leading to Hudon being selected by the Vegas Golden Knights. With Hudon being eligible to be taken in the Expansion Draft, the Canadiens could risk losing him to the Golden Knights before he ever becomes a long-term piece with their franchise. Signed to a very affordable deal for two years, it isn’t out of the realm of possibility to imagine Vegas taking Hudon given his upside and inexpensive contract. The Canadiens will have some decisions to make when they submit their protection list. As it stands, the team has to make decisions on the following forward: Tomas Plekanec, Mac Pacioretty, Andrew Shaw, Brendan Gallagher, Alex Galchenyuk, Drouin, Paul Byron, Phillip Danault, Daniel Carr, Alex Radulov and Hudon among others. It won’t be easy for the team to decide who they should protect among that list, but with Hudon’s relative inexperience at the NHL level, it would be hard to justify protecting him over other key players at forward. If a player like Hudon is protected, another quality forward who could fill a role immediately for the Golden Knights can be taken from the Canadiens. If Hudon is left unprotected, the Golden Knights could view Hudon as a player ready to break into the NHL next season and utilize him in a role that best suits him. While the Canadiens are always searching for playoff success, the Golden Knights have some time to build a team that has a chance to be competitive now, but that is definitely competitive in the near future. A player like Hudon who is still only 22-years-old (though turning 23 in a week) fits the criteria for developing young players now while aiming for a competitive team within the next few years. It’s an interesting narrative for the Canadiens, but for Hudon, this contract likely means he’s finally found his way into the NHL.